Channel 4's first episode of The Great British Bake Off has won the channel's biggest audience in five years with 6.5m viewers and a 30% share. The ratings were lower than on the BBC, where the show regularly got over 10m viewers, but Channel 4 has set the bar low. Viewing peaked at 7.7m with a 34.6% share. Ad buyers gave a broadly positive response to the show, which was appearing for the first time on commercial TV since Channel 4 poached it from the BBC. Four food brands, KFC, Stork, PG Tips and Carte D’Or, appeared in the first ad break, along with eBay, Freeview and Kia Sportage. 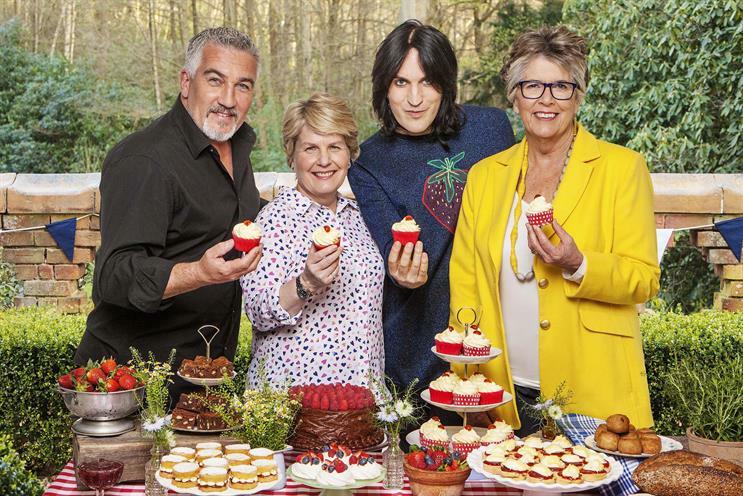 Channel 4 claimed The Great British Bake Off, which has new presenters Noel Fielding, Sandi Toksvig and Prue Leith, was the highest rating show since the 2012 Paralympics’ opening ceremony. The show got almost twice the audience of Channel 4’s previous highest rating show this year, Diana: In Her Own Words, which was seen by 3.5m viewers. Channel 4 also claimed it won its highest peak-time share for 16-34s in over 10 years, since Big Brother. Helen McRae, chief executive of Mindshare, said she was "positive" after seeing the first show and the reaction on social media had been broadly "good". She added that ad buyers will want to see if the audience continues as some viewers may have tuned in out of "curiosity" but she said: "I think it will be a success." Catherine Becker, chief executive of VCCP Media, said: "The show overall was excellent – C4 did a great job. The key is the contestants, like X Factor, and there were some talented bakers." Jay Hunt, Channel 4’s chief creative officer, said: "The Great British Bake Off’s audience last night proves it’s still one of the country’s favourite shows. I am delighted millions watched the new team put 12 magnificent bakers through their paces. It’s the largest share of young audiences we’ve had for a show for over a decade." Becker noticed some Twitter comments "complaining about ads" but said viewers must recognise a free-to-air show "needs to be paid for somehow". James Murphy, chief executive of Adam & Eve/DDB, said: "Our family of bakers was riveted and it felt like the best-loved bits of Bake-Off with some freshness and verve. I expected the show somehow to be traduced and it wasn’t." Channel 4 used close to its maximum ad minutage – the number of minutes of ads per hour – that is allowed under Ofcom rules. One media-buying source warned: "The challenge for Channel 4 will be to hold or grow the audience whilst managing the maximum break minuatage that they utilised – four centre breaks at three and half minutes each. "However it’s the strongest overnight launch of a show for Channel 4 since 2012, which is good news for advertisers looking to reach an upmarket audience on mass [media]." The show was 58 minutes’ long in the 75-minute slot and the remainder was ads. Twitter said there were 123,000 tweets during the episode and a spike of 2,700 tweets per minute. Lyle’s golden syrup and Dr Oetker are sponsoring the series.